The world economy is now at its most dangerous point in history. In virtually every major country or region, there are problems of a magnitude which individually could trigger a collapse of the financial system. Because of the interconnectivity of the system, when the first domino starts falling, there is zero possibility to stop all the other unstable dominoes from crashing one after the other in quick succession. The world is now staring down a deflationary black hole that is on the verge of sucking into it all global debt of $250 trillion plus unfunded liabilities and derivatives of another $2 quadrillion or so. That would be the end of the financial system as we know it. Governments and central bankers around the world are of course totally aware of this and are standing with their fingers ready to push the button for the biggest money printing bonanza that the world has ever experienced. Look at Europe – Deutsche Bank, which is one of the biggest in the world, is valued at less than 1% of its asset value and it has derivatives which are standing at 20x German GDP. The share price is telling us that DB is bust. And so are Greek banks, Italian as well as Spanish, Portuguese and French banks and many more. Deutsche has now become front page news and its survival is no in jeopardy. It has total assets of EUR 1.9 trillion but a deposit base of only EUR 450 billion. This means that DB is totally dependent on short term loans to finance its massive balance sheet. 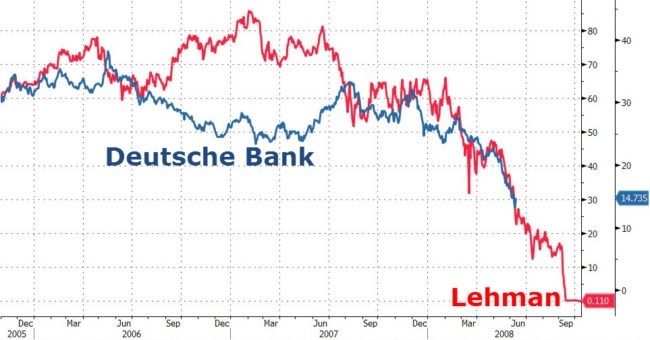 That is extremely dangerous and the reason for Lehman’s demise. The pressure on DB is likely to increase in coming weeks. ECB money printing of €80 billion a month or €1 trillion per year is having no effect. Central banks are now pushing on a string. The bail out of Italy’s fourth largest bank Monte dei Paschi is failing. Germany is totally against the ECB stepping in and the Italian government doesn’t want to bail in the depositors. That would be a political disaster. Non-performing loans in Italy are 20% of assets and growing. It confirms my view that no debts, bank or sovereign will ever be repaid. The news from around the world is just getting worse by the day. Japan’s Yen 80 trillion ($0.8T) printing programme is having no effect. Kuroda (Governor of BoJ) is totally lost. He is currently buying all the bonds that the Bank of Japan is issuing. The BoJ is a top 10 shareholder in 90% of Japanese stocks. So not only is the BoJ holding Japanese bonds that they can never repay but they are desperately trying to support the Japanese stock market. Just as the bonds will become worthless, they are likely to lose at least 90% on their stock holdings. The balance sheet of the BoJ is now approaching Yen 0.5 quadrillion ($5T) which makes them the biggest money printer in the world. But it won’t stop there. Kuroda’s latest folly is to hold the 10-year bond interest rate at 0% for an undetermined period. As investors start dumping Japanese bonds, the BoJ will need to print unlimited amounts of Yen and increase debt exponentially to keep rates at zero. This is a policy which is guaranteed to fail. The debt explosion in emerging markets has created a disastrous situation for many countries. Corporate debt in these markets has grown massively in the last ten years and is now standing at $25 trillion. Without continued growth of exports and higher commodity prices, these countries will go into a deflationary spiral. According to the Bank for International Settlement the debt to GDP ratio in China is 3x greater than what the BIS calls a dangerous level. The growth of Chinese debt from $2T to $32T in this century has probably created the credit bubble of all bubbles. A lot of this money has gone to big infrastructure projects that have zero value and yield no return. Bad debts in China are estimated at $2T but are probably considerably higher. In the US, corporate debt has grown from $2 trillion to $6 trillion in the last 10 years. A lot of this debt has been used for share buybacks and have thus not created any economic value except for a few shareholders and executives. And US Federal debt will have doubled from $10T to $20T during Obama’s presidency. This is an absolutely remarkable and unacceptable increase and a clear sign of a country on the road to bankruptcy. No country that runs substantial budget deficits every year for 55 years has any chance of survival. The only reason the US economy hasn’t collapsed yet is that the dollar is still the reserve currency of the world. But the dollar doesn’t deserve to be a reserve currency. Against the Swiss Franc for example, the dollar is down 77% since 1971. And against gold, history’s only surviving currency, the dollar is down 97% since 1971. It is only a matter of time before the dollar starts its final journey to its intrinsic value of zero and so will many other currencies. Thus we are standing on the edge of a black hole that very easily could cause a deflationary implosion of all financial assets and all debt. No government is talking about this and no central banker dares to mention the seriousness of the present situation. The smallest final snowflake that can push the world over the edge and start the deflationary avalanche. It is really surprising that central banks dare to hold back on the biggest printing programme ever for so long. Because they only need to be a few seconds late and they will not be able to stop the collapse. Let’s assume that central bank will intervene in time and print first tens of trillions and eventually hundreds or even quadrillions of dollars, euros, yen etc. We will then see a hyperinflationary period which will be bigger than both the Weimar Republic or Zimbabwe for the simple reason that the figures involved now are so much greater. But we know of course that we cannot create wealth by printing worthless pieces of paper or creating zeros in a computer. So sadly, the world will not be saved by this money printing which will only create more debt. It is of course impossible to solve a problem by the same means that caused it in the first place. After the hyperinflation, which will have solved nothing but just created a bigger problem, we will still see a deflationary collapse. This will be absolutely necessary to get rid of all the debt and the bubble assets. It will be like a forest fire that will get rid of all the dead wood and create the foundation for new strong growth not lumbered by debt. This is the only way that the world can progress and grow, totally free from debt, decadence and the all the false values that the current era has created. It will not be easy to protect yourself against the coming upheaval. It is likely to involve social unrest, wars, famine, disease and massive suffering for most people. During this period of transition, money will be needed as a method of payment or for barter. Throughout periods of crisis, whether inflationary or deflationary, gold has always functioned as money. 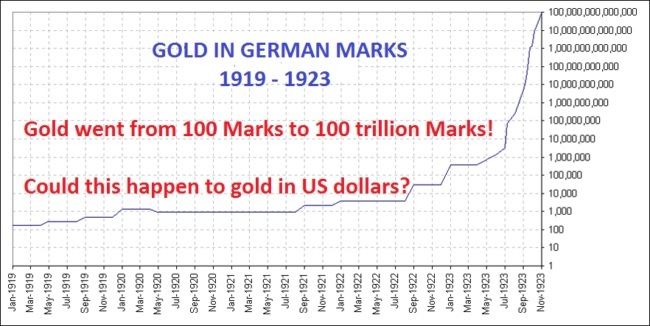 During the hyperinflationary period, gold will reflect the destruction of paper money and appreciate substantially both in inflationary terms as well as in real terms. What most people don’t realise is that gold also normally does very well during deflationary periods. If we get the deflationary implosion that I have discussed above, there will be no financial system for a while and gold will be one of the few methods of payments. This is why gold will also be excellent protection in a deflationary period although the nominal value will be much lower than in a hyperinflationary period. Thus with the current unprecedented risk in the financial system and the world economy, physical gold, and some silver, will be the best insurance and protection that anyone can hold.